The Spalding 88365 acrylic 54 inch backboard in ground system provides many institutional grade features at a fraction of the cost. This model provides you the sturdiness of 4x4 inch square post at the price range of a 3.5" round post. The acrylic backboard material provides a superior rebound to traditional plastic based backboards. Also, this system comes with a backboard pad for added stability and protection against collisions. 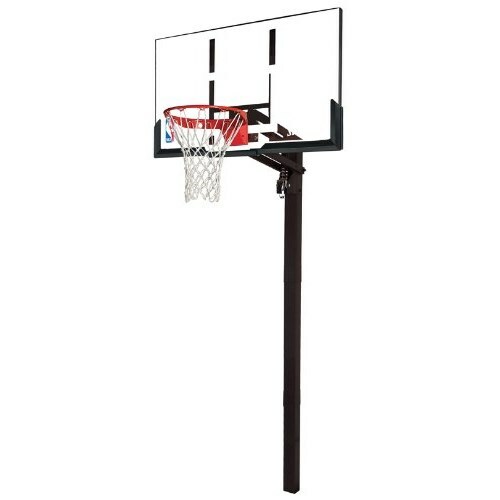 Just about anyone can have fun using this system by using the U-Turn lift mechanism, which allows you to adjust the rim height anywhere from 7.5 ft. all the way up to regulation height, 10 ft.
Includes the manufacturer's warranty from Spalding - 1 year on all parts but the backboard; 5 years for the backboard. 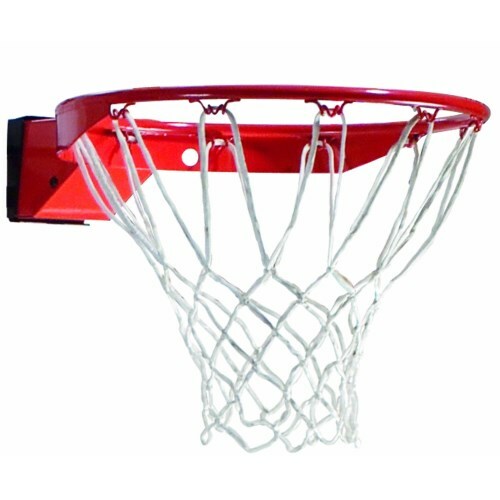 Please also see our entire line of Spalding Basketball Goals. Backboard dimensions: 54 inches W x 32 inches H.
Acrylic material measures 5/32 inch thick. Comes with an Arena Slam Breakaway Rim. 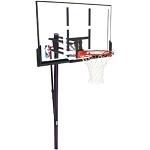 Backboard comes with a board pad for added stability of the system and added protection for players. The pole is a 4x4 inch square post. Includes ground sleeve for easy installation and removal of the pole in and out of the ground. Rim height adjustable from 7.5 ft to 10 ft using the U-Turn mechanism. The U-Turn height adjustment mechanism uses a turn crank. U-Turn has a removable handle to prevent product tampering. Includes manufacturer warranty; 1 year on parts, 5 years on backboard. Fast shipping: product leaves the warehouse typically within 1 to 2 business days. Ships from warehouse in Alexander City, Alabama. FedEx delivery; no signature required for most deliveries. Shipping weight: about 117 lbs. Shipping dimensions: 55.5 inches x 34.31 inches x 6.75 inches. The shopping experience was great! Arrived on front porch exactly as promised and well packed and protected. Very well designed and instructions clear. In ground system is more involved than I expected but not hard if have two people to help with lifting assembled goal system. this is an awesome setup for the price but you must take the time to install it correctly. After ground sleeve is set in concrete, assemble 3 piece Square pole put back and ground sleeve and run Rebar all the way through bottom to top just short of bolt holes. This makes for a much stiffer pole. Follow directions carefully. I used exactly 1,040 pounds of concrete. 13 eighty pound bags. Rent a portable mixer believe me you will be glad you did! when done properly this unit has a very professional feel to it. My son loves it. Q: Who handles warranty claims for this system? A: Warranty claims go through the manufacturer, Spalding. They can be reached at 1-800-558-5234. 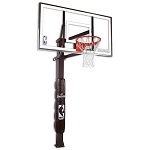 Get fast shipping for this Spalding 88365 basketball hoop! 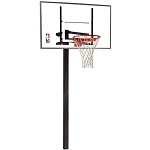 Orders for this basketball hoop generally leave the warehouse in Alexander City, Alabama within 2 business days. Delivery of this product, when ordered by itself is a doorstep delivery via FedEx. No signature required for residential shipments. Returns of this product are accepted up to 30 days after delivery of the product. As this product ships directly from Spalding, before returning the item you will need a return authorization and return shipping address before proceeding. Please contact us for help with this. Please also note the costs of any return by viewing our entire Return Policy.